The XRS 9945 provides total protection and peace of mind with Super-Xtreme Range Superheterodyne Technology, detecting all 15 radar/laser bands with its super-fast lock-on detection circuitry. The unit provides extra detection range and the best possible advance warning to even the fastest of POP mode radar guns. Other features include Cobra exclusive full-color Extreme Bright DataGrafix Display, an 8-point electronic compass, Voice Alerts, car battery voltage display/low car battery warning and much more. With the optional GPS Locator and AURA Database, upgrade your unit to alert you to verified Speed and Red Light Camera locations, dangerous intersections, and reported Speed Trap locations for entire United States and Canada (purchase and subscription necessary). AURA Camera & Driving Database (optional) GPS-based technology warns the driver of fixed speed and red light cameras, speed traps and dangerous intersections across North America. The AURA database is updated daily and provides the industry's most complete and accurate coverage and reliability. GPS Locator purchase required to receive service. Car Battery Voltage Display/Low Car Battery Warning Provides approximate voltage of your car's battery and also alerts user whenever car battery voltage falls below 11.9 volts. 15-Band Detection Detects 7 radar, 6 laser and 2 safety signals. Radar signals include X Band, K Band, Ka Superwide, Ku Band, VG-2, Spectre I and Spectre IV+. Laser signals include LTI 20-20, Ultra Lyte, ProLaser, ProLaser III, Stalker LIDAR and Speedlaser. Safety signals include Safety Alert and Strobe Alert. IntelliScope (optional) This Patent-Pending Technology provides information about the direction of Location Based Alerts relative to your moving vehicle using Global Positioning System. GPS Locator purchase required to receive this feature. Programmable Up to 1,000 Location Alerts (optional) Add up to 1,000 location-based alerts of your choice. GPS Locator purchase required to receive this feature. Programmable Speed Alert (optional) Provides alert when exceeding driver-preset speed limit. GPS Locator purchase required to receive this feature. Digital Speedometer (optional) Provides accurate, current vehicle speed using Global Positioning System. GPS Locator purchase required to receive this feature. Latitude/Longitude Information (optional) Provides accurate latitude/longitude information using Global Positioning System. GPS Locator purchase required to receive this feature. S-XRS Maximum Performance Technology New and improved Super-Xtreme Range Superheterodyne (S-XRS) detection technology, with its super-fast radar lock-on detection circuitry, provides maximum detection range and best possible advance warning to even the fastest of POP mode radar guns. Full Color ExtremeBright DataGrafix Display 1.0" OLED display provides enhanced data display in easy-to-read vivid colors. Also allows user to select from 5 different color schemes to match dash illumination (Full Color, Blue, Orange, Green and Red). Voice Alerts Warns driver with specific voice annunciation of the signal being detected. Strobe Alert A Cobra exclusive, works with tens of thousands of emergency vehicles currently equipped with traffic light controlling strobe emitters. Provides advance warning of the presence and/or approach of emergency vehicles. IntelliShield False Signal Rejection 3-Level City Mode offers the best false signal rejection in both urban and rural areas. SmartPower Automatically shuts off power to the unit when ignition is turned off. EasySet Programming Menu User-friendly mode selection/setting with visual guidance. 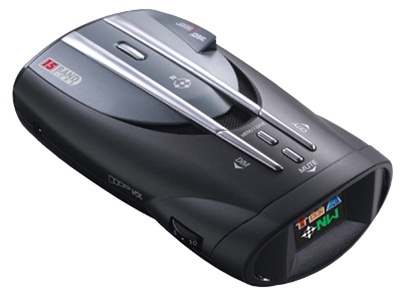 8-Point GPS Compass (optional) Provides accurate, 8-point directional reading using Global Positioning System. GPS Locator purchase required to receive this feature. 8-Point Electronic Compass Automatically provides an accurate electronic direction heading. Not too impressed with it. When it picks up a cop laser it stays at ka1 until i am right in front of the cop then it goes crazy. My friends radar starts with ka1 then gets higher and higher each second that we get closer. (ka 1 ka 2 ka3).